Welcome to Waterfalls of Thailand Blog. UM PHANG IS A DISTRICT WITH A GREAT PIECE OF LUSH FOREST that owns the 6th most beautiful waterfall of the world and the largest of Thailand, Tee Lor Su Waterfall. Tee Lor Su in Karen language means the black waterfall or the great, awesome waterfall. It proves to be the right name since this waterfall runs fiercely and is amazingly grand, especailly in rainy season. 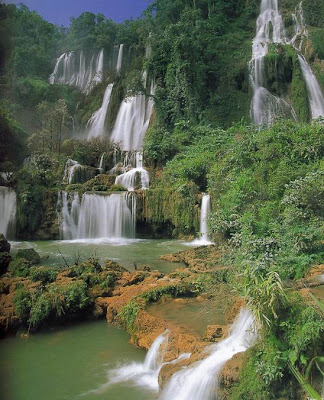 Originated from a stream called Huai Klo Tor, Tee Lor Su Waterfall is about 900m above average sea level. It is 500m wide and runs down in steps approximately 300m high. Surrounded by lush green forest, the waterfall has altogether 3 levels. The lowest level is a vast rocky ground where ones can relax and walk around, the second level is a grand yellow limestone cliff covered with a curtain of water running down to the emerald green pond, whereas the third or the highest level is simply inaccessible for visitors due to the very strong current. Tourists could not only watch the beauty of Tee Lor Su iterfall from the front, but they can also trek to the beauty spot at another hill that is located right oppoisite to this fall. Although the path is prett steep, slippery, and exhausting, the reward is worth it. From his beauty spot, ones can clearly and fantastically see the whole Tee Lor Su Waterfall running down the towering cliff. To visit the great Tee Lor Su Waterfall, you can either make it a one-day-trip and come back to spend the night at Dm Phang town, or make a longer stay and spend the night in a tent near the national park office. One thing you should bear in mind is, the road to this fall is very steep and winding. So if you are not a skilled driver and are not bringing a 4WD, it is a good idea to board a bus or buy a travel package in Urn Phang town. Apart from simply witnessing the greatness of this fall from the sites mentioned above, tourists could also choose to raft along the stream to Tee Lor Su Waterfall, which is indeed a very interesting activity It is in fact a short rafting course, but the nature along the riverbank is very green and charming. Starting from Um Phang town, the boat will be running along the Mae Klong River which is a pretty large and swift river. Prepare to meet with an exciting journey and tourist attractions as followings. Tee Lor Jor Waterfall: Tee Lor Jor Waterfall (meaning the rain waterfall) is a minor fall near Tee Lor Su Waterfall. It is similar to a rainfall down the cliff covered with green moss and fern. Tourists love to stop by at this spot for a swim, except for the rainy season when water level is too high. The Hot Stream: Not very far from Tee Lor Jor Waterfall is a small hot stream near the Mae Klong River. In cold season, tourists love to come here and get soaked up in this warm stream. Pha Leud-Pha Bong: Pha Leud (meaning a bloody cliff) is a famous towering cliff with fresh red spot; whereas Pha Bong is an amazingly large hole in a limestone cliff. Pha Leud Forest Ranger Forest marks the end of the rafting activity which takes about 2 hours. After that, ones need to continue with car for 17km or aound 1 hour to the national park office and walk further for 1.8km in order to get the Tee Lor Su Waterfall. In rainy season, however, ones need to continue rafting further from Pha Leud to Tha Sai, and get to Tee Lor Su Waterfall on foot (around 11 km or 3 hours). Therefore, it is highly recommended that you leave for the fall in early morning, so that you will reach the national park office before dark. The best time to visit Tee Lor Su Waterfall is from October to May. At that period, ones may travel conveniently by car, by boat, and on foot. If you wish the see the most impressive waterfall, however, it is a nice idea to visit this fall between June and November, especially from August to October when the water is full and tourists are scarce, but you may travel only by boat and on foot. The best time for rafting at Tee Lor Su Waterfall is from November to December. In case you wish to feel more excited with stronger currents, come rafting between June and October. Tee Lor Le Waterfall: Tee Lor Le Waterfall is about 80m high. The water flows out down to the upper part of Mae Klong River, at the junction between Dm Phang and Thoong Yai Naresuan Wildlife Sanctuary. Apart from watching its beauty, ones can also ride a boat to this waterfall as well. However, most tourists prefer not to make a long ride from Dm Phang, but rather start from Pa La Tha Village. The distance of this rafting activity is approxinately 40km and the journey takes 5-6 hours. Karen Villages in Dm Phang: Dm Phang is one of the oldest district in Tak, and this area around Thailand and Myanmer border used to bf the residential area of the Karen tribes. Today tourists could very well visit these villages, whose villagers still make a living by farming, elephant keeping, and weaving. The oldest and the largest of all 25 villages is the Ban Pa La Tha or Pa La Tha Village, which is located around 27km from Um Phang town along the road Um Phang-Pa La Tha. There are most elephants here and the villagers also organize a homestay style of travelling for tourists. Apart from this village, ones can also very well visit Ban Se Pla (3km from Ban Pa La Tha), Ban Ti Po Ji (60km from Um Phang), Ban Kho Tha (a popular getaway of foreign tourists, 3 hours away on foot from Ban Pa La Tha), Ban Mong Qua (70km from Um Phang) and Ban Le Tong Khu (100km from Um Phang). Um Phang Wildlife Sanctuary does not have lodging houses for tourists, but there are altogether 3 campgrounds that could accommodate approximately 500 persons. In travelling season, you may find some shops and and restaurant near the national park office. From Tak-Um Phang town, take highway 1 (Tak-Kamphaeng Phet) for 7km. Then turn right into highway 105 (to Mae Sot district) for 87km, and turn left into highway 1090 (to Um Phang town). The distance is 164km. From Mae Sot to Um Phang, the route will be extremely steep and winding along ranges of mountains, so that the road is called the sk road. It will take no less then 4 hours to reach Um Phang district. From Um Phang, you can get to Tee Lor Su Waterfall by car, by boat and on foot. For car, tourists could bring a 4WD vehicle only, or hire a bus from Um Phang. You can as well buy a travel package to Um Phang Wildilfe Sanctury and walk further for 1.8km to the waterfall. Nevertheless, please note that the road is open only from December 1st to May 31st. For boat, tourists could raft from Um Phang to Pha Leud (15km or around 2 hour), and then continue with car to the wildlife sanctury office (another 17km), and on foot to the waterfall (1.8km In rainy season, your choice narrows. The best way is to raft from U Phang to Tha Sal (25km or about 3 hours), and trek further to the f. for 11km. In order to get to the Tee Lor Su Waterfall, ones need to carry a permission to enter the wildlife sanctury. You can have such document by contacting the Tourism and Conservation of Um Phang Forest, whose office is about 200m from the gateway to Um Phang district.